﻿ Cirneco dell etna. ERA. Sicily. Height: 46 см, weight: 9 kg. ERA was born in our kennel out of the combination of Ambra and Barbaresco. She has inherited all the best qualities of both parents. And accumulated in her pedigree very valuable Italian bloodlines of the breed. 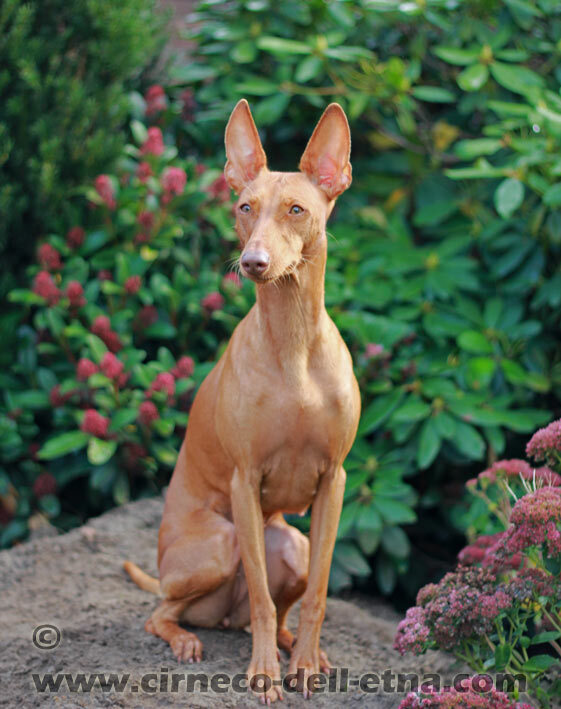 This female is splendid original cirneco dell etna type. Nice long neck. Sculptural lines of irreproachable head. Beautiful top line. Her appearance charms and delights eye! Era grew up within our Cirneco family and has got the best natural education. She is uninhibited, free and easy. With something of stubbornness of an unbroken horse :-) But she listens oldest dogs implicitly and never argues with her mother. Era is the pride of our kennel. Always successful in shows. Vivid person. A model for magazines.